They are used as Control switches in Control Panels and equipments such as Phase Changeover Panels, MV & HV - Vacuum Circuit Breakers, Gas Circuit Breakers, On Load Tap Changers, Motor control panels, instrumentation Panels, Machine tools & Electro-medical equipments. The switches are used as Mains switch, Selector Switch, Programme Switch or for tripping or closing of breakers either locally or from remote site. 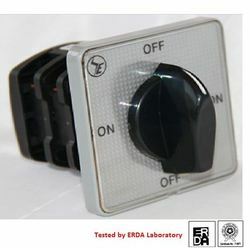 These switches offer advantage of having unlimited combinations of switching angels and indexing angels with stay put and spring return momentary contacts. Lost motion contacts can be cascaded, used for additional protection or for activating annunciator. Copyright © 2017-18 Shirke Electro Pvt. Ltd. All rights reserved.